Oh, remember! The "beer" I added softens the beef and makes the curry mild. It is more like stew and easy to eat. Please try it out! 1. 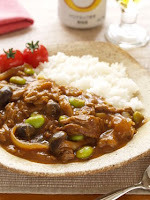 Use Vermont Curry or you can substitute it with any other Japanese curry roux! Doesn't make a big change! 2. Cut thinly sliced beef into bite size pieces, sprinkle with salt and pepper. Slice onion. Remove tough base of shimeji mushroom and break into bite-sized chunks. Thaw and remove the edamame beans from the pods. 3. Heat cooking oil in a large stew pot, saute the sliced onion over medium heat until it softens. Then add the beef and shimeji mushrooms and saute together. 4. When mushrooms get soft, add 500cc water, bring to a boil, skim the scum, add 200cc beer, and turn the heat down to medium-low and cook for about 15 minutes. 5. Turn off the heat, add Vermont Curry curry roux, and mix well until completely melted. Then put on the heat and simmer for about 10 minutes until thickened. 6. Add edamame beans, stir, and cook 3 more minutes. 7. Serve on a hot bed of rice, garnish with grape tomatoes if desired. Is thinly sliced beef available in your country? Oh no... too bad. I just received a message and knew that I lost the lottery to run Tokyo Marathon... Okay, I'll run at gym!! !